For years, I've been using this exercise of choosing a word for my year. And if doing so has taught me anything, it's that focusing your intentions into just 1 word (or phrase, or mantra... but especially just 1 single word) is powerful! I love to focus my mind and energy into a single word so that all my thoughts and intentions pass through its filter. Think of it like a theme for your year! There's not magic to finding your word. Usually, mine come to me as I start to wrap up one year in my head and open up my heart to the one upcoming. Usually, a few words float around my thoughts, then synonyms, and then one word just feels right. In 2009 my word was VISIBLE. Which was perfect for the evolution of my blossoming photography business. In 2010 my word was UP (or "RISE") and I envisioned all the aspects of my life floating up and up and up. A few rough years of stormy seas uprooted my system and I didn't start to get back on track till I noticed I'd been living the word CALM in 2013 without even realizing it. Last year I never picked a word. Looking back, I'd say it was probably BRAVE because I forced myself to be so that I could step into a new direction of my life. In 2015 my word was POSSIBILITY which proved to be appropriate as I grew my coaching biz with almost record breaking speed. In 2016 I chose the word UNLEASHED which ended up being way more relevant to my personal life than to my work life. The first year a word has ever been more influential in that way. This year's word was a challenge. At first I was leaning towards words meaning something like "the energy it takes for a plant to grow up through a sidewalk". I had read a quote I loved and I couldn't get it out of my head. I lingered on words like "unearthed" and "emergence". But they didn't seem right. I was liking the idea of "reveal" but all of it felt too fluffy. I wanted a word with more discipline. Something that might not make me feel as good but that forces me to take action each and ever day. I'm feeling like I'm at a precipice and I need to get to work climbing it. So what word means all that? The quote I read was, "The energy rose in me from down under, the kind of energy that sends flowers and grass through cracks in the driveway." YES! Now what word means that??? There's a symbol I'm planning on more my next tattoo. It's an old nordic symbol called a Rune and it's called an ignuz. It looks like two x's placed side by side and touching so a diamond shape is created between them. When I read that quote above I instantly thought of the meaning of the symbol. There's not really one word, it's more of an idea. It's the idea of "where there's a will, there's a way". It's also the concept of limitless potential, such as the energy inside of a seed, it's boundless! But it's not just potential, it's action. The ENERGY that pushes plants up through cracks in a sidewalk. That's what ignuz is about. It's more than possibility, it's the actual force that makes it happen. Where there's a will, there's a way. 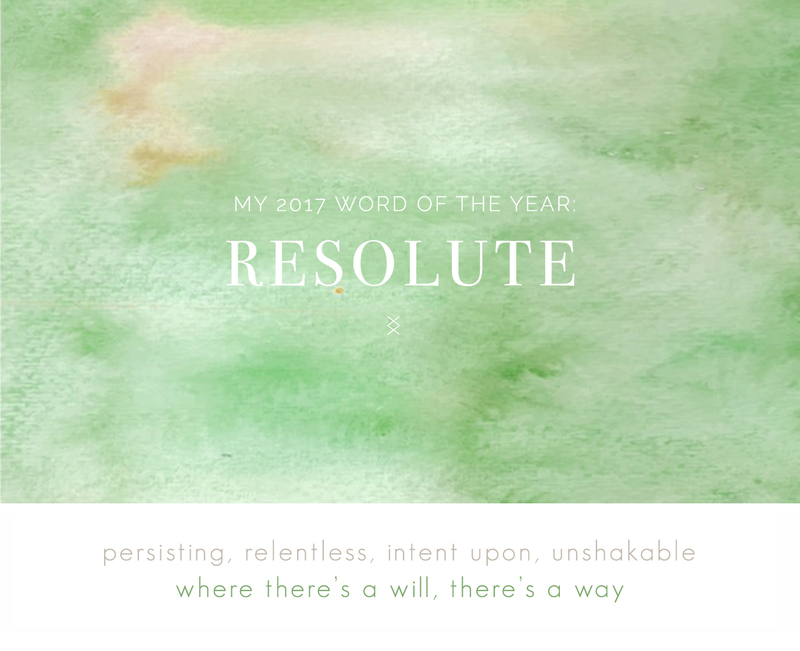 I don't even remember what I was reading when the word RESOLUTE popped right off the paper at me. There it is. RESOLUTE. Where there's a will, there's a way! Doesn't sound a bit like the energy that pushes plants up through the cracks in the sidewalk?! If there's a way, I plan on finding it. Concrete? Impossible? Just watch me find a crack in that pavement! 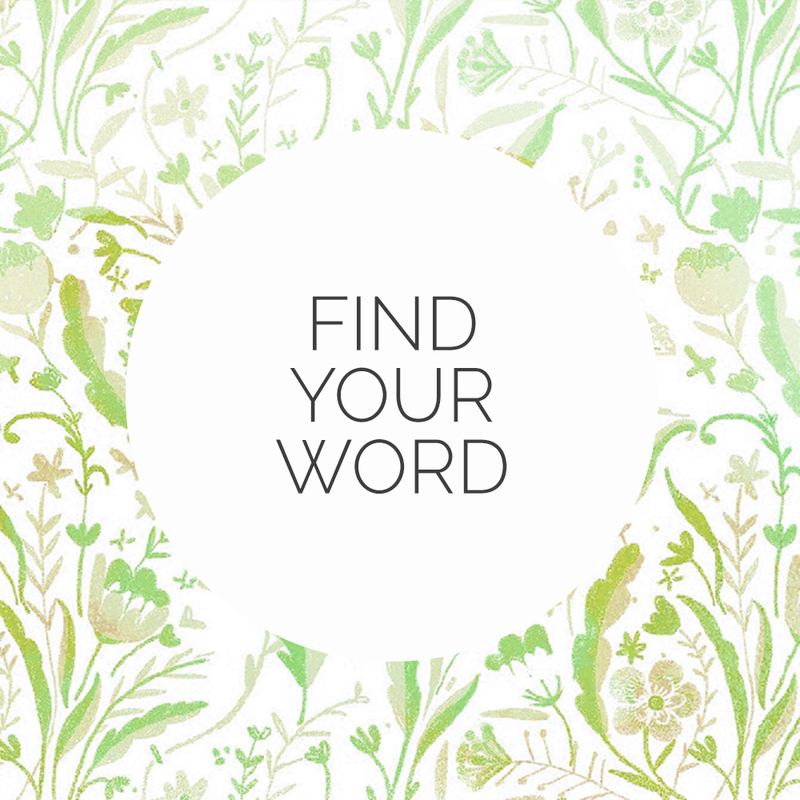 What are your words (or word) for 2017? I'd love to know! And if you need more help figuring it out, I made this quick video a few years back explaining more about how I discover my word for the year and what I do with them after! Enjoy. Still need more help? One of my favorite bloggers, Susannah Conway, has put together a workbook called Unraveling that will help you!